PM Netanyahu says Jews can now fight back against anti-Semitism, have allies around the world after massacre at Pittsburgh synagogue. Prime Minister Binyamin Netanyahu sent a message of support to the Jewish community of Pittsburgh one day after a gunman massacred 11 people attending morning prayers in a synagogue. 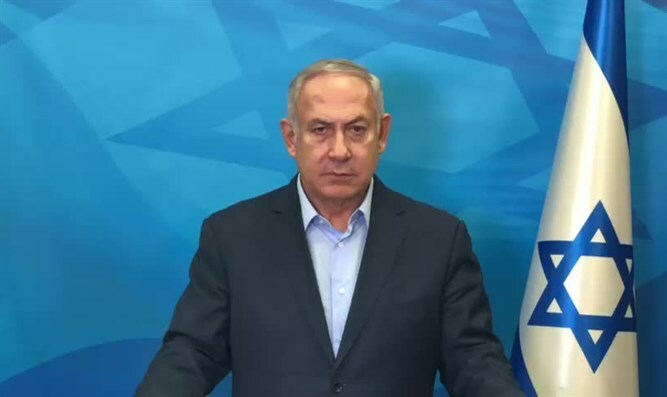 "On behalf of the government and people of Israel, I want to express our profound condolences to the families of those who were murdered in this horrific attack, and our wishes for a speedy recovery for all the victims. "Over the centuries, Jews have been subjected to every kind of savage attack imaginable – from blood libels and massacres to pogroms and genocide – for nothing more than the “crime” of being Jewish. After the Holocaust, many hoped that anti-Semitism would finally be relegated to the dustbin of history. It wasn't. "In fact, in the past couple of decades, antisemitism has emerged once again as a potent and deadly force. "We saw the evil of anti-Semitism in Durban, Mumbai and Toulouse, in Copenhagen, Brussels, and Paris, and in so many other places across the world. "In the United States, there was an antisemitic attack in a Jewish Federation in Seattle in 2006 and outside a JCC in Kansas City in 2014. In 2017, we witnessed that despicable antisemitic rally in Charlottesville. And now we have seen the worst antisemitic attack in U.S. history against worshipers in a synagogue in Pittsburgh, a particularly heinous crime that we in Israel have unfortunately experienced as well. "While these attacks are nothing new in the history of our people, what is new is our ability to fight back against the anti-Semites. Israel does that every day. "But the Jewish people are also blessed to have many friends around the word who reject and fight anti-Semitism. "I want to express my appreciation to President Trump for unequivocally condemning this heinous crime and for pledging to fight those who seek to destroy the Jewish people. "But President Trump is not alone. Over the past 24 hours, we have heard clear condemnations from American leaders across the political spectrum, as well as from leaders around the world. "These statements are important. So too are actions that governments take to protect their Jewish citizens, whether that means providing security for vulnerable Jewish communities to passing tougher laws against hate crimes. "I know that the Pittsburgh Jewish community is strong and proud, and I have no doubt that in the wake of this horrific attack that community will emerge stronger and prouder than ever. "In this hour of immense grief, the Jewish community of Pittsburgh and all Americans who mourn today should know that the Jewish State mourns with you. "May the families of all who died be comforted among the mourners of Zion and Jerusalem."